Heat gas or charcoal grill for indirect cooking. Spray 4 (4-inch) metal tart pans with cooking spray. Remove pie crust from pouch; unroll on work surface or cutting board. With pizza cutter, cut crust into 4 equal pieces. Press 1 crust piece in bottom and up side of each tart pan. Place pans on grilling pan or grill-safe baking or pizza stone. Place grilling pan on unheated side of two-burner gas grill with one burner heated to medium. (For one-burner gas grill, place pan on grill over low heat. For charcoal grill, move medium coals to edge of firebox; place pan on grill rack.) Cover grill; cook 10 minutes or until crusts are lightly golden. Remove from grill to cooling rack; cool completely. Remove tart shells from pans. In chilled large deep bowl, beat whipping cream and 1/4 cup of the sugar with electric mixer on low speed until mixture begins to thicken. Gradually increase speed to high and beat just until soft peaks form; set aside. In medium bowl, beat cream cheese and remaining 1/4 cup sugar with electric mixer on medium speed until creamy. Beat in honey. In small microwavable bowl, microwave hazelnut spread uncovered on High about 30 seconds or until warm. Add to cream cheese mixture; beat until combined. Gently fold in whipped cream. Refrigerate until serving time. To serve, pipe or spoon filling into tart shells. 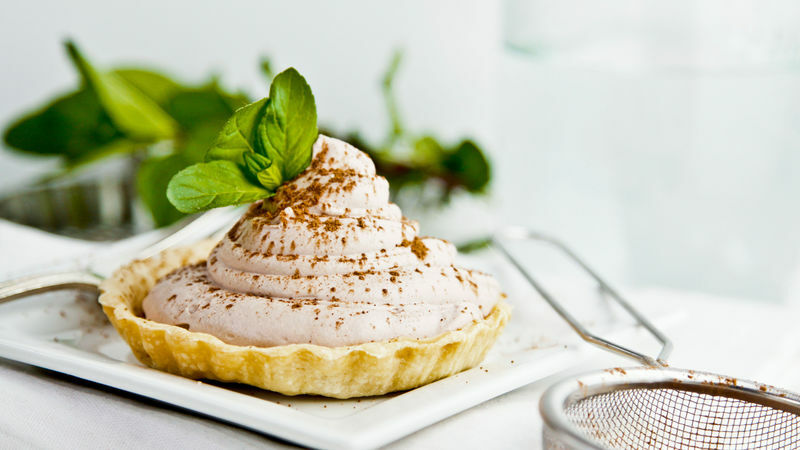 Garnish these tarts with a dusting of unsweetened baking cocoa and fresh mint leaves or sprigs. To bake the tarts in the oven, preheat oven to 450 and bake about 5 minutes or until golden brown.